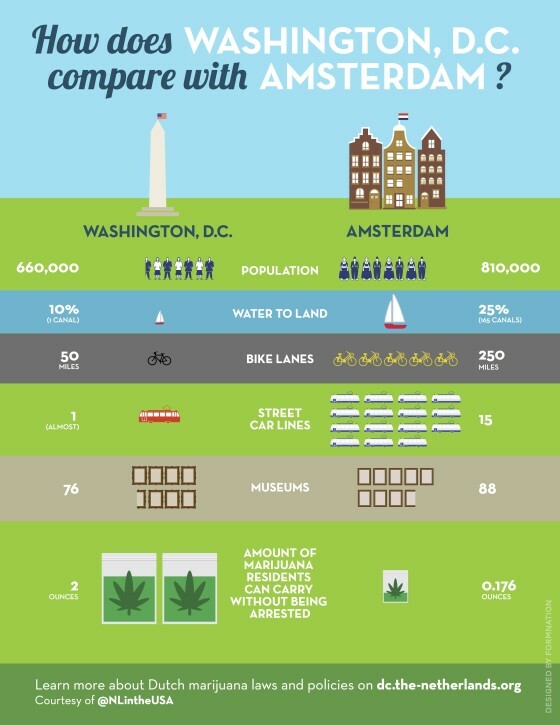 The Dutch embassy in Washington has published this handy infographic, outlining all the ways Amsterdam and Washington are different. It’s a response to DC’s mayor’s assertion that decriminalising marijuana will not turn the city into, shock horror, something like the Dutch capital. The embassy even published a special website page highlighting the differences in drugs policy. The page concludes by pointing out that Americans are more likely to smoke weed than the Dutch. ‘The lifetime rate of marijuana consumption for ages 15-64 in the Netherlands is 25.7% compared to 41.5% in the US,’ the website states.